"This dessert could not be simpler and the result more delicious. A perfect marbled swirl of creamy chocolate cheesecake in a moist cake - a sure, easy winner of a recipe." Line 13x9-inch pan with parchment, with ends of parchment extending over sides. Prepare cake batter as directed on package; pour into prepared pan. Beat remaining ingredients with mixer until blended. Spoon over cake batter; swirl gently with knife. BAKE 35 to 40 minutes or until toothpick inserted in centre comes out with clean. Cool completely. Use parchment handles to remove dessert from pan before cutting to serve. Top with chopped fresh fruit just before serving. Prepare using a chocolate cake mix or 1 pkg. (450 g) brownie mix. Prepare using plain PHILADELPHIA Brick Cream Cheese, and blending 1 oz. 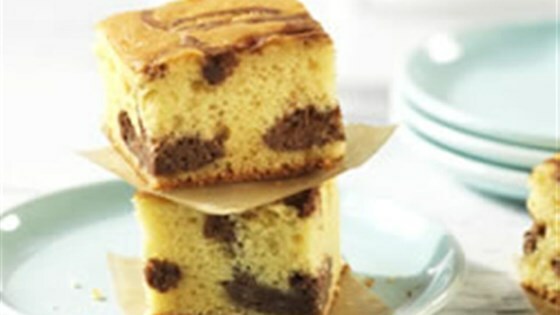 melted BAKER'S Semi-Sweet Chocolate into the cream cheese mixture before spooning over cake batter in pan. I did not find the chocolate philly cream cheese, so I used regular cream cheese. It came out great! Very moist!